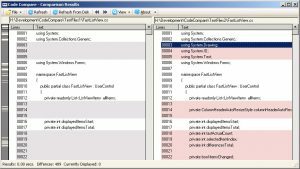 Code Compare is a comparison and synchronization tool that compares text, source code, XML files and directories, then highlights differences and merges content via its visual interface. Code Compare can make version comparing and code reviews a much easier process. File compare compare two files at a time, with the ability to merge differences between compared files. Folder compare comparison of local/network directories, providing a visual interface for analyzing differences between two paths. Line compare allows for a single line comparison and replacement. Advanced Editing Options for easy file merging, including multi line copy, delete. Summary Bar gives a quick overview of differences between files or directories. Recently I ported this project to .net core 3.0 which now has an implementation of WinForms. The project with full Source Code is now avaiable on GitHub.